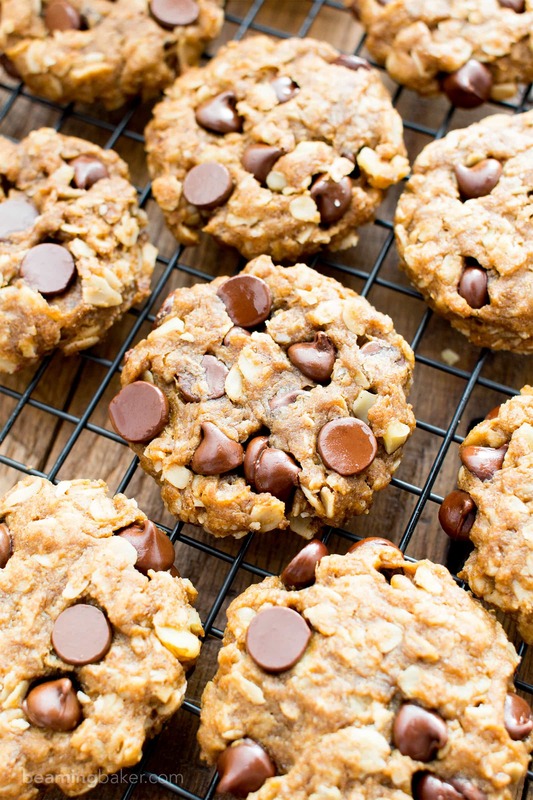 Easy Gluten Free Peanut Butter Chocolate Chip Oatmeal Cookies (V, GF): an irresistible recipe for lightly crispy, perfectly chewy peanut butter oatmeal cookies. Vegan, Gluten-Free, Dairy-Free, Refined Sugar-Free. Happy November! Totally one of my fave months—which has nothing to do with it being my birthday month. Ahem. 😉 November is just one of the most activity-packed, and thus, sleepiest months for me. Is it just me, or do you also get super sleepy when you have lots to do? This month, we’re celebrating my mom’s birthday (which is technically in October, but still), my birthday, getting all the preparations ready for Thanksgiving, and then we have the buildup to Christmas. This year, I’m super excited because my whole family’s gonna be in town for Thanksgiving! It’s been years since we all got together for this holiday. We usually do Christmas or a summer new-baby-is-about-to-pop-out get-together. Yes, that’s a thing. 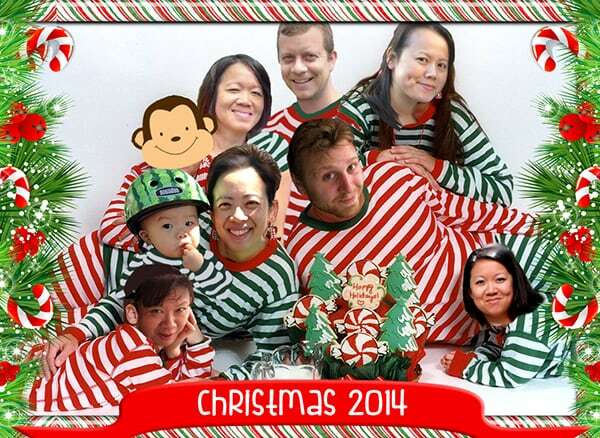 And just like last year, I’m more than determined to get us to all do a family portrait. But we’ll hang onto the photoshop’d tactic—only to be used if absolutely necessary. Or, if Erik and I need a few giggles. By the by, what are your favorite Thanksgiving Day desserts? Side dishes? 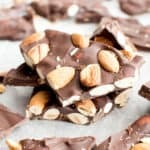 I’d love to hear some ideas so I can start putting together my Thanksgiving Day menu (instead of just whipping up all the Choc+PB desserts like these no bake chocolate peanut butter bars). <– But who would complain?? Back on topic, a few years back, Erik would specially request a marshmallow-topped sweet potato casserole. Let’s just say we didn’t eat the healthiest foods back then. And let’s just say that each casserole turned into a HUGE disaster because we amped up the brown sugar and marshmallows so much that there was hardly any sweet potato left. And let’s just also say… that we’d determined that it wasn’t quite the sweet potatoes we were after, but the sugar and the marshmallows. And… perhaps that just turned into one huge, sugary/syrupy/gooey mess. Picture a casserole dish FULL of donut glaze. Make that marshmallow donut glaze. Now that we’re all adult and responsible about our eating (most of the time), we like to tone down the 7-year-olds in us and practice some restraint when it comes to whipping up all the Thanksgiving Day treats. 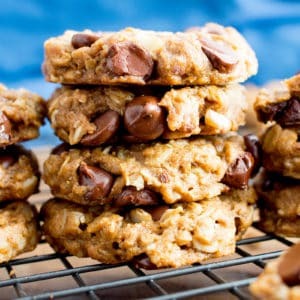 But just in case things get out of hand with Erik and my 5-lb bag of coconut sugar, I’m making a double batch of these Easy Gluten Free Peanut Butter Chocolate Chip Oatmeal Cookies beforehand. 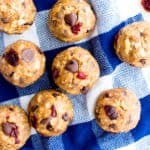 These Easy Gluten Free Peanut Butter Chocolate Chip Oatmeal Cookies are the perfect treat/snack to keep you going: jam-packed with protein, whole ingredients and just a bit (alright, totally more than that) of chocolate! They come together pretty quickly. And once they’re out of the oven, oh goodness. Just try and see if you can wait ’til they cool down. They’re perfectly crispy on the outside, soft, moist and chewy on the inside. These are totally one of my favorite cookies of all time. 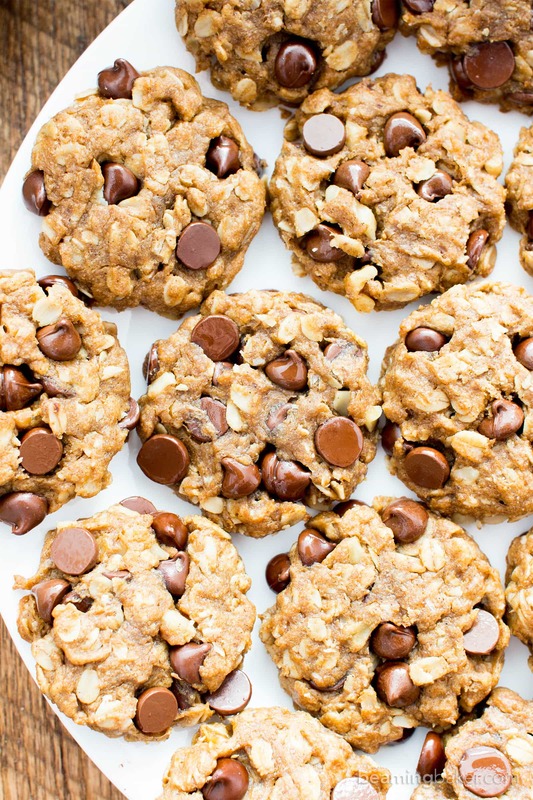 So, you might’ve noticed that there is another peanut butter chocolate chip oatmeal cookie on the blog. 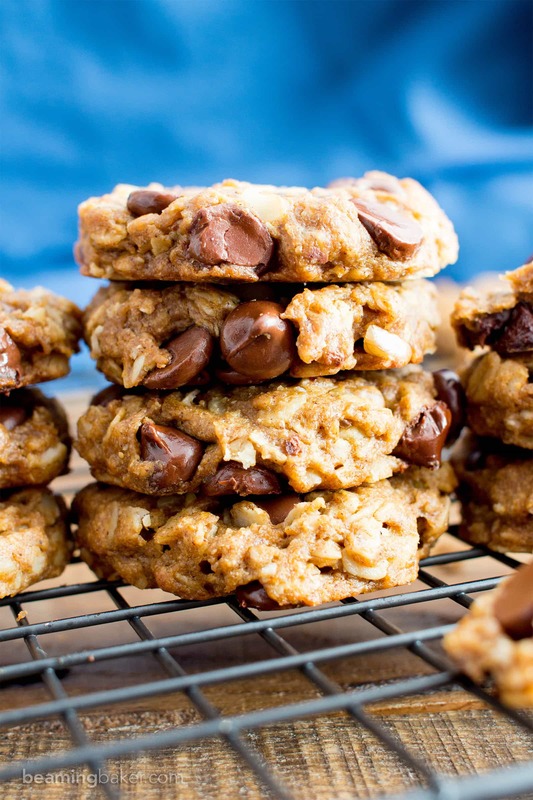 Er, you may have noticed and managed not to say anything because: who doesn’t want more peanut butter + chocolate chips + oatmeal? While those were and still are a big hit in my house and yours, I figure I’d switch up that recipe a bit to accommodate all of the substitution questions I’ve fielded in the past. This recipe doesn’t have any coconut flakes in it!! Yay!! Just in case you weren’t a fan/are allergic to coconut. I’ve also dialed down the amount of sugar so you can feel even better about eating these. Lastly, I adjusted the recipe just a tad so the cookies would turn out slightly crispier on the outside and slightly softer on the inside. I hope you love all of the changes—and I can’t wait to hear your feedback. 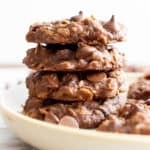 Easy Gluten Free Peanut Butter Chocolate Chip Oatmeal Cookies (V, GF): an irresistible recipe for lightly crispy, perfectly chewy peanut butter oatmeal cookies. Vegan, Gluten Free, Dairy-Free. In a medium bowl, whisk together all of the wet ingredients: peanut butter, coconut oil, coconut sugar, flax eggs and vanilla. Whisk until well mixed. Pour the wet mixture over the dry mixture. Using a rubber spatula, fold the ingredients together until well combined. Fold in chocolate chips and walnuts. 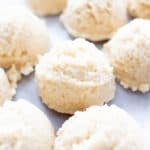 Using a 2-tablespoon cookie scoop, scoop and drop cookie dough balls onto the prepared baking sheet, spaced evenly apart. Using a fork, flatten cookies to desired thickness. They will not spread during baking. 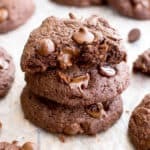 Optionally, press chocolate chips into the top of each cookie. Bake for 10-14 minutes. Transfer cookie sheet to cooling rack. Allow to cool for 1 hour. Enjoy! Storing instructions below. 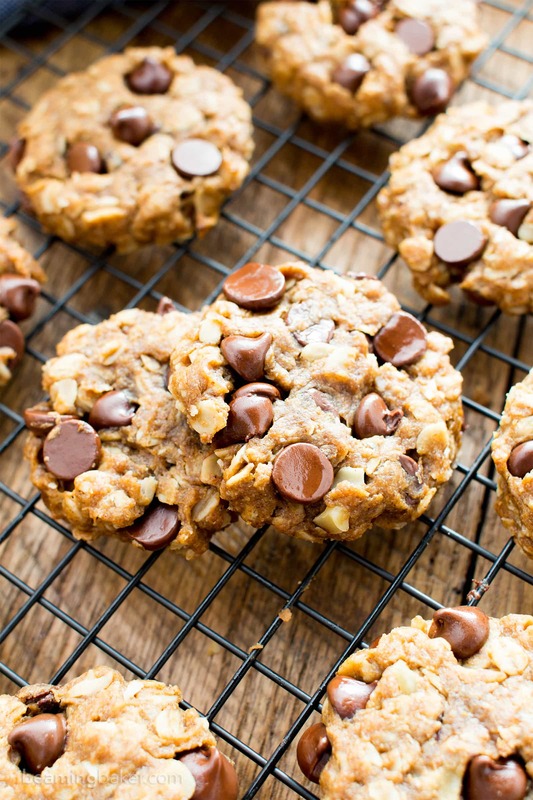 - Adapted from my Peanut Butter Chocolate Chip Oatmeal Cookies and my Vegan Almond Butter Walnut Oat Cookies. 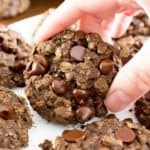 - More easy cookie recipes: double chocolate oatmeal cookies, pumpkin chocolate chip breakfast cookies, no bake peanut butter fruit & nut cookies. Instead of flax eggs can you use reg eggs? How many? What changes are made…. 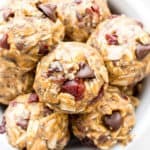 I don’t mind your super quick and easy recipes, in fact, I LOVE them, especially when they contain peanut butter and chocolate! These cookies look absolutely delicious! The only thing better than a cookie is a cookie with less guilt ;)Totally adding them to our Christmas baking list this year! Oh YES!! We all deserve guilt-free treats! 🙂 Enjoy! 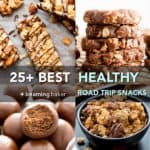 What can I substitute for peanut butter or almond butter ? Hi Jane! 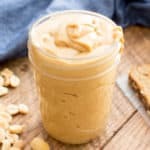 You can use your favorite nut or seed butter: sunflower seed butter, cashew butter, etc. Enjoy! can i use honey instead of coconut sugar? if so how much? These look amazing! 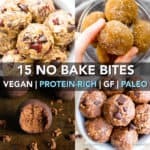 Can I use regular regular oats and oat flour? Thanks for this post! If I only have brown rice flour on hand, would that work in this recipe instead of the oat flour? Just made these and subbed maple syrup for the coconut sugar. These are totally delicious. I must make my cookies big as I only got 12 out of the recipe. Great cookies! Loved the recipe! I did make a few changes to it because of what I had in my pantry. I used 1/4 maple syrup instead of coconut sugar. And because it made the dough more runny, I had to add more oat flour at the end to make them into balls. And I used eggs instead of flax. Added in chopped pecans instead of walnuts and even a bit of toasted coconut since I had it on hand! They are perfect with a hot drink. Not too sweet to where you can’t stop eating them and end up with a stomach age. Just right. Can’t believe they are gluten free! Thanks for a great recipe. Yay!! So happy to hear it, Susie. 🙂 Loved hearing about all the modifications you made due to your pantry (we’ve all been there haha). Happy baking! Wonderful! I’m so happy to hear you enjoyed these, Susan. 🙂 Happy baking! I made these today. They Are excellent. My husband said, don’t lose that recipe! 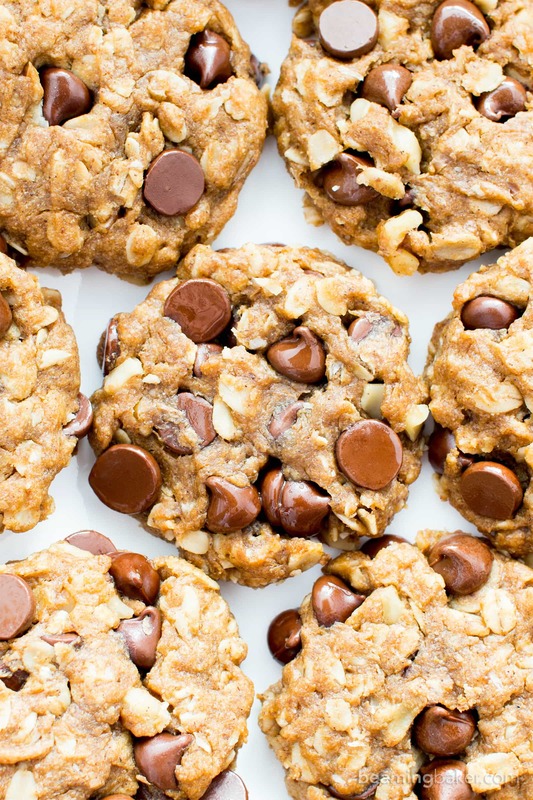 Did you know how much calories per cookies this recipe has? Or Do you have the nutritional facts for this recipe, by the way, look amazing!! Do you know how much sugars grams this recipe has, or how many calories are? It look delicious by the way. 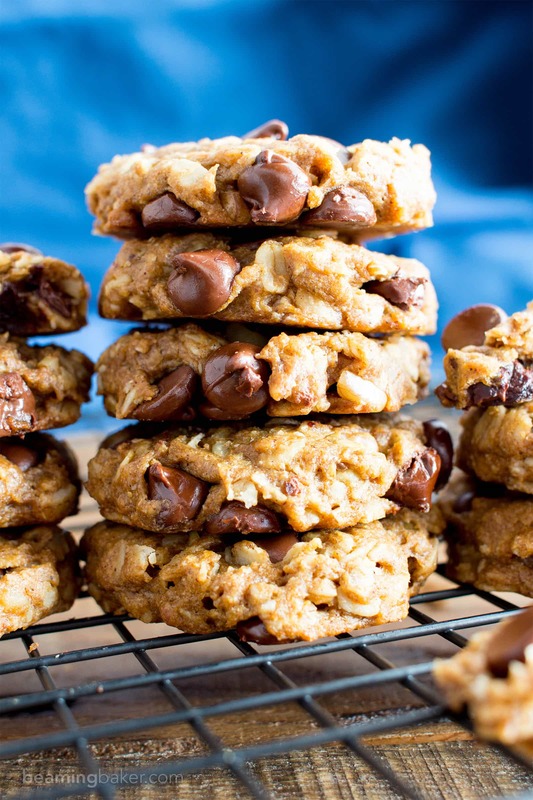 I have all the ingredients on hand except rolled oats… Can i use oat flour in place of rolled oats? And make it 1 cup oat flour?? I will be baking these soon and get back to you. how many calories are for each serving ? Hi Jenny! Sorry, I haven’t calculated that yet. These look delicious! Can you sub applesauce for flax eggs? I make these every week! Hi! I’ve got ripe bananas on hand. Could i sneak them in? I’ve been searching oatmeal cookies all day and I don’t know why I didn’t just come to you first. These are great! I’ve made these before. I’m about to start making them again but I wonder if I could freeze them. I want to make a double batch, one for my kids at home and another for my son in the military. Will they come out ok if I freeze them, then take them out a few days later before I put them in the mail? Hi Tammy! Haha glad you enjoy the cookies. ???? And how sweet of you to make a care package for your son! Hm, whenever I freeze these I usually eat them right away after thawing, so I’m not sure how they would hold up thawing while in transit. Let me know how it turns out! Hi Demeter, this is another amazingly easy and decadent tasting recipe. Thank you! !